To begin with, this page tells about some of Seaham tragedies. Indeed, some of Seaham tragedies go back to the early 1800’s. On Tuesday 26th June 1873, a dreadful boat accident took the lives of five men. This all happened within hailing distance of the end of the pier. Having finished work and wishing for an adventure on that long summer evening of long ago, seven bottle makers John Jefferson, Ralph Hush, James Coyle, Robert Miller, Joseph Hall, Benjamin Turns and Andrew Davison engaged a coble and placed themselves under the charge of Morley Scott junior, an experienced junior pilot. The boat was brand new and the skipper was a seaman of much experience. In short, the seven passengers were mature and sober men. The weather was very calm so there should have been little possibility of a mishap. Morley Scott rowed the coble out of the harbour and then raised the mast to catch the breeze. When they were about three hundred yards out from the old north pier, Morley Scott’s brace button snapped. Therefore, he was in danger of his trousers falling down. He had a needle, thread and a spare button so decided to repair the button. While he done this, he handed charge of the sail to James Coyle, who he believed was an experienced sailor. A slight wind then hit the sail, James lost his grip then the sail fell into the water. The situation was still not a dangerous one and Morley, seeing the slight problem, forgot his trousers and moved towards the side of the boat to pull the mast back upright again. Unfortunately the other men in the boat, being inexperienced, all moved instinctively to help him. The boat overbalanced and tipped over throwing all eight into the water. Benjamin Turns, Andrew Davison and Morley Scott survived and were able to walk home unassisted. But, the other five drowned. The Seaham Colliery explosion of Wednesday October 25 1871 occurred at 11.30 pm and 26 miners died. By now the pit was employing 1100 men and boys. Had the explosion occurred during the day, then a lot more miners might have lost their lives. Indeed, people could feel the shock at Seaham Harbour. The force of the explosion pushed John Clark, aged 9, at least 10 yards. He was sitting on the surface in a cabin near the pit shaft. The force of the blast was such, that many ponies died in their underground stables 1.5 miles away from the epicentre. Two men named Hutchinson, father and son, working as marras (mates), fired the shot which triggered the blast. The father, Thomas senior, survived the explosion but his son suffered terrible injuries. For days it was touch and go between life and death for the boy. But survive he did only to die in the 1880 explosion (details below). Thomas Hutchinson junior left a pregnant widow and two children. 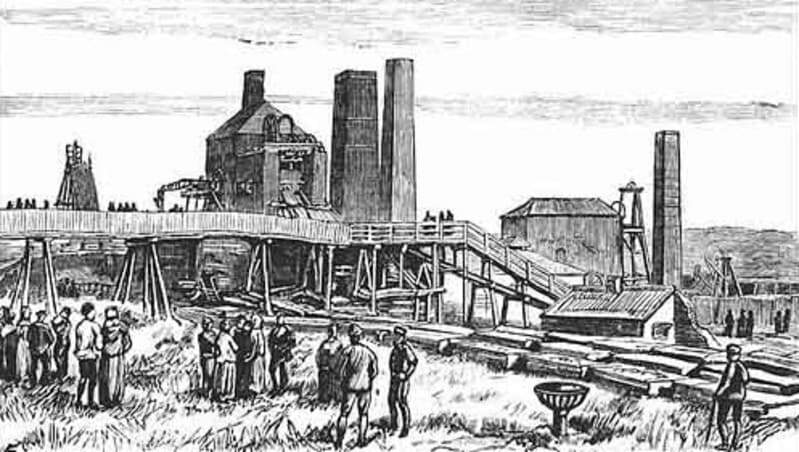 The Seaham Colliery Explosion on the 8th September 1880, claimed 164 lives out of a shift of 230 men. It occurred, without warning at 2.20am during a maintenance shift. However, they were not mining for coal at the time. Thus, they didn’t expect any escape of explosive gas. They fired a shot in an area of stone where there was a considerable amount of dust on the ground. The dust came from their preparation for a ‘refuge hole’. In short, it was the suspension of this dust in the air that ignited with tremendous effect. No one from the immediate area survived of course, such was the scale of the explosion. Some trapped miners survived for a while, but died before rescuers could unblock the shafts and reach them. The tragedy, is the second worst in the long mining history of County Durham and the third worst in the history of the Great Northern Coalfield. The families of those dead or missing were unable to get anywhere near the colliery, of course. But, eventually the crowd round the pit reached an estimated 14,000 on the Wednesday. By Sunday, there was an estimated 40,000 people in the vicinity to see the first mass funerals of the 164 men and boys killed in the 1880 disaster. The badly-faded gravestones of at least two of the victims of the Seaham Colliery disaster are now leaning against the walls of the disused St John’s graveyard in Seaham Harbour. The previous Seaham Tragedies are not in living memory, but this one is still in there. On Saturday, 17th November 1962, a fishing trip from Seaham, ended in tragedy. Gordon Burrell, Donald Burrell his son David Burrell, George Firth and Joseph Kennedy were in a coble when it began to take in water. The boat, called Economy, took sail despite the rough seas. The George Elmy, Seaham’s lifeboat, went to their rescue. The sailors transferred from the coble into the lifeboat safely and they headed back to Seaham Harbour. However, as the lifeboat reached the piers it overturned as a result of two massive waves hitting the boat. John Miller, Arthur Brown, Leonard Brown, James Farrington and Fred Gippert, the lifeboat crew, all died. The only survivor from the coble was Donald Burrell who had wrapped his arm around the propeller shaft to stay afloat. Tragically, his son David who also died, was only nine years old. As a mark of respect, the new coast road has the name of George Elmy Lifeboat Way. If you wish to read the article about the history of Seaham, click here. Obviously, you may make a comment here if you know of other Seaham Tragedies or wish to add some more details. However, we also have a Wearside and District Forum to open a thread about other Seaham Tragedies too. So, click here if you want to join in there. Our Sunderland Message Boards (SMB) are for all Wearsiders, Mackems and SAFC supporters alike. Tagged Pit Explosions, Seaham Colliery Explosion, Seaham Disasters, Seaham Fishing Tragedy 1962, Seaham Maritime Disaster 1873, Seaham Tragedies. Bookmark the permalink.